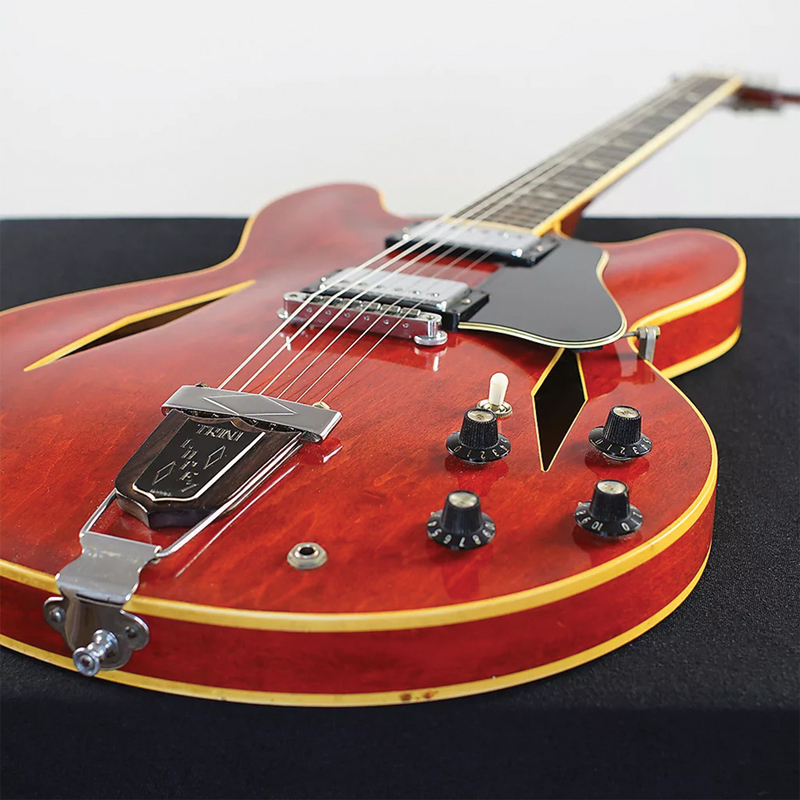 While never one of the more mainstream models in the Gibson catalogue, the Trini Lopez signature guitar of the 1960s has gained extra notoriety in recent years. One of the key reasons is Foo Fighters mainman Dave Grohl’s love for this instrument, which informed the design of his DG-335 signature model – a Pelham Blue-finished semi that borrows much of its identity from the Trini. 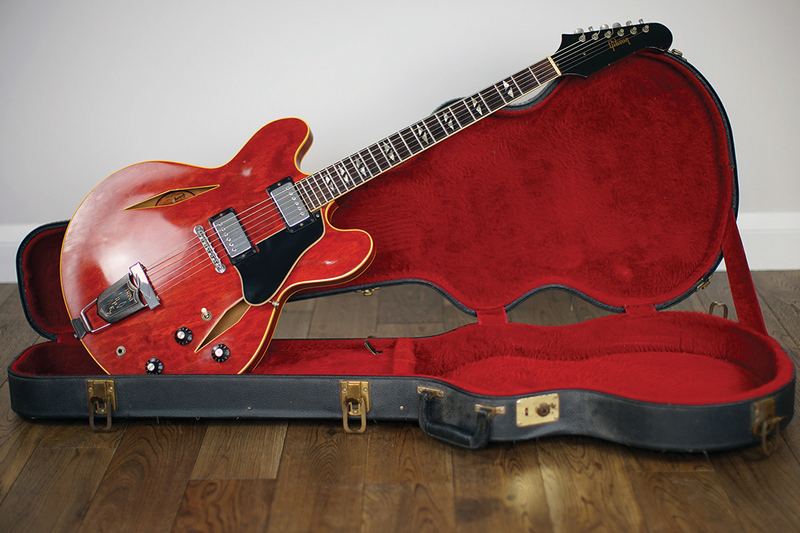 First appearing in 1964, Gibson actually produced two distinct Trini Lopez models – the Standard and the Deluxe. Both of these guitars followed a wave of other signature semis and hollowbodies from that period, which included the Tal Farlow, Johnny Smith, and Barney Kessel models. 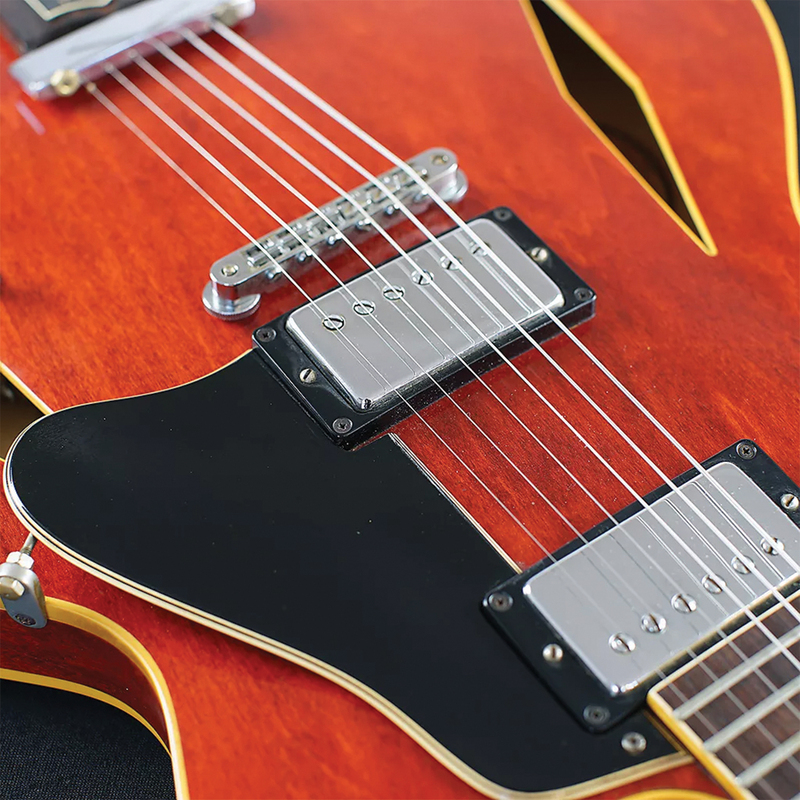 With its pointed cutaways, the Trini Lopez Deluxe echoed the shape of the Barney Kessel signature, while the Trini Lopez Standard – the guitar we’re dealing with here – was closer to a Gibson ES-335TD. 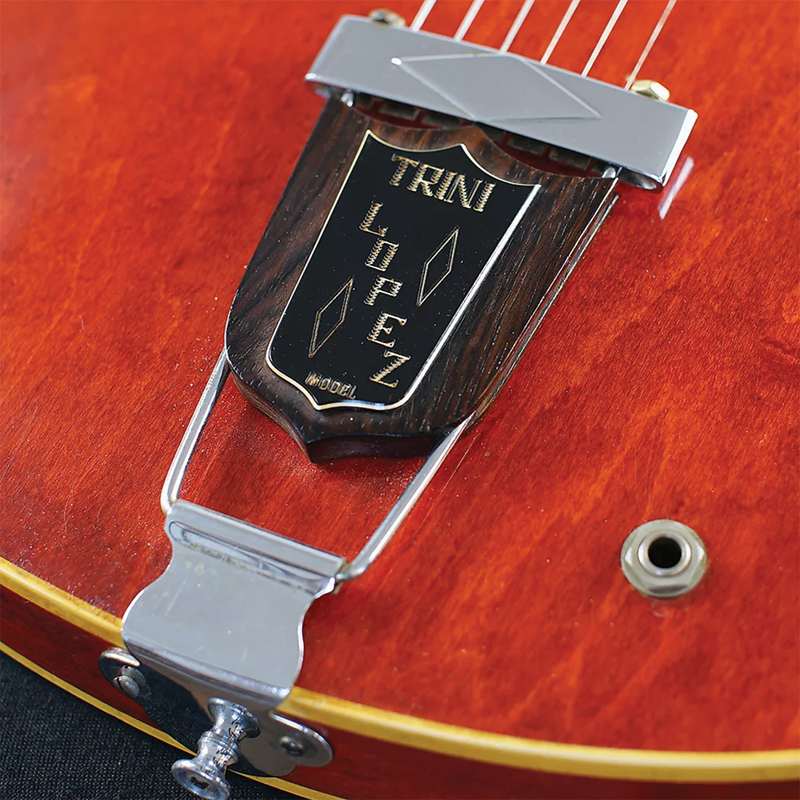 Both Trinis were distinguished by the inclusion of diamond-shaped soundholes, split diamond inlays, a slanted Fender-esque headstock (that would also be used on non-reverse Firebird models), and a ‘Trini Lopez’ monikered tailpiece. This Trini Lopez Standard comes from Nicks Guitars and is a classic example. 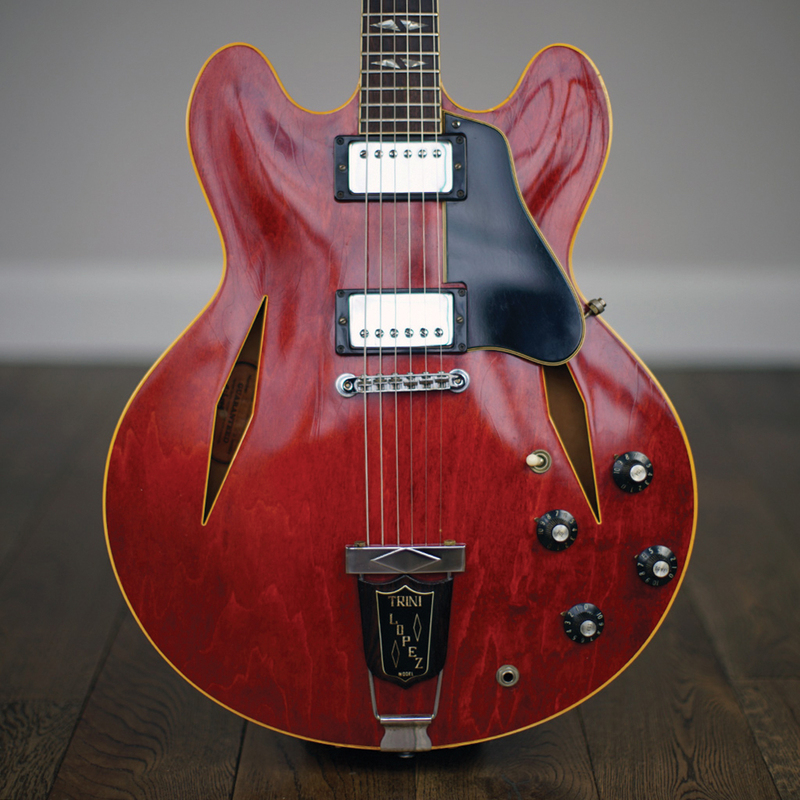 While rare Pelham Blue Trinis are the most coveted, Cherry Red specimens are also well-regarded – especially when exhibiting attractively grained maple on the top of the body. This guitar does just that. Everything on this example is original with the exception of the bridge, which appears to be have been replaced at some point. There are, as expected, some minor marks and dings on the body, as well as some checking in the finish. But there’s nothing that would take this guitar out of the very good to excellent condition column, and certainly nothing that would de-motivate a potential buyer.